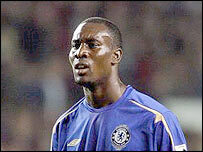 Carlton Cole claims unrest in the Chelsea camp could open the door to a first-team chance for him. Cole, 22, is ready to cash in on what he claims is a rift between Argentine striker Hernan Crespo and Blues boss Jose Mourinho. The England Under-21 striker said: "I don't know what's going on with Crespo but he's unsettled. "And with Didier Drogba off to the African Nations Cup, I hope my chance will come sooner rather than later." Cole himself is reported to be seeking talks with Mourinho over his lack of first-team opportunities at Stamford Bridge. He said: "Crespo is an established player but he wants to play every week and he hasn't, so you can see his problem. "But I'd love to be in his shoes and I'd like to get my chance." Cole, who spent a spell on loan at Aston Villa last season, insisted he would not be seeking a move away from the Premiership champions. He said: "I'm not going to ask Chelsea to sell me because it would be stupid for any player to tell a world-class club to sell him. "I'll talk to the manager and see what he wants to do with me. I don't question him because he is the manager and he knows what he is doing. "I am confident in my ability or I wouldn't be here. But I need a run of games. "A lack of match-practice affects your sharpness and when you play you want to make an impact and show your manager what you can do. "I don't know what the answer is, it's down to the club. I haven't set myself a time limit but let's see what happens in January."